No - please don't adjust your computer screen - my legs are that pale. However, I was wearing SPF 2million, so my efforts to stay forever young yield a saddening side effect of blinding whiteness. But in the sake of fashion, I wanted to share a quick outfit post from a recent weekend jaunt. So put on your shades and let's talk clothes. 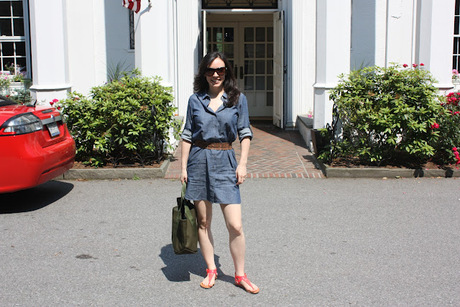 When traveling, especially in the car, I prefer lightweight dresses such as this chambray piece spotted above. Nothing is worse than setting out for a road trip in something constricting and uncomfortable, making the endless pit stops that are inevitable a hassle to the tenth power! A simple braided belt and bright sandals complete the jet-set look. Ok - more like rental car ready than jet set - but I try to dress for the job I want. Stay tuned later this week for a post with pics of the trip - city folk enjoying time in the country. Yeehaw.